It is always refreshing to enter into February knowing that focus is drawn toward the subject of Love. Perhaps the time has come for us to become more adept at anchoring our hearts and minds on love perpetually, never needing a reminder from the outside world. It is my heartfelt belief that we—all of us—have been created through the essence of pure love, that we shall return to love and that love is, in so many words, all there is. Why not celebrate it every day, in every living thing, in every moment? If we all agreed to do this, everything on the planet would instantly change, for there cannot be negativity where love resides. Being a child of the sixties, I grew up believing that “all you need is love, love, love is all you need.” (The Beatles) That ideal was not easy to personally realize until I finally came to understand that love is not something that comes to you from the outside. Rather, love is something that, when you discover its ever-Presence within your own heart, everything changes, permanently. You become free, empowered, clear, courageous, joyous and filled with deep peace and calm. You begin to open your heart and allow everything to flow through you with non-attachment, respect and wonder. You begin to live more and more honestly in the present moment without dragging the past along with you, nor do you spend precious energy on false pretense of the unknown future. You let go of false expectations of what others should or should not do to secure your happiness in the world and discover that your happiness depends only upon you, no one else. You truly become one with all that is and anchor your life in your center. Life is sweet and gets sweeter every day. Just go into love. Not wishing it would come to you from someone else, but discovering the ever-Presence that is your birthright through the Divine essence that resides in the center of your exquisite, magnificent heart. The theme of Marydale’s Thought for the Day, Volume II is love, so we choose it as our Read of the Month, because February is a month devoted to love. As anyone who has connected to the Source within can tell you, love is at the core of everyone and everything in the Universe. It is the essence of who we are. When Marydale sits, asks, and allows the Thought to flow through her, she feels this love and hopes that reading her inspired messages will assist others to tap into this love, as well. 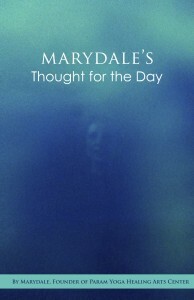 There is a picture of a heart on the cover of Marydale’s Thought for the Day, Volume II, and photographs of hearts—taken by Marydale herself—can be found throughout the book. 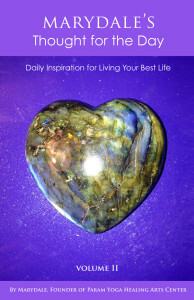 She wanted to remind readers that living your best life starts with living from the heart. During this month of love, make Marydale’s Thought for the Day, Volume II a Valentine to yourself. Hold the book against your heart, close your eyes, and when you are ready, ask Spirit to give you what you need on this day. Then open the book and read the first Thought you see. May love fill your life throughout the month of February and always. You can purchase Marydale’s Thought for the Day, Volumes I and II in our online store or at Amazon.com.